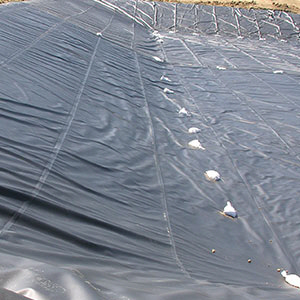 GEOSKRIM N40BHD is a scrim reinforced geomembrane, consisting of a flexible and conforming linear-low-density polyethylene and a chemically resistant high-density outer layer. The closely knit 9x9 weft inserted polyester scrim reinforced core is fully encapsulated. The outer layers are formulated to provide an optimal balance of environmental stress crack resistance, toughness, and for excellent resistance to aqueous chemicals and solvents. Exceptional durability, high tensile and puncture strengths are achieved with the combination of high-strength polyethylene and a dense scrim reinforcement. GEOSKRIM N40BHD geomembranes are produced in the color black as standard, and are available in other custom manufactured colors with minimum order quantity requirements. Click here for Product Data Sheet.